Save Pumphouse & Reef Road! Two of Florida’s most iconic surf breaks are threatened by the poorly planned and unnecessary expansion of the Lake Worth Inlet for the Port of Palm Beach. There has been startlingly little discussion of potential damages to recreators and recreational resources impacted by the Port of Palm Beach expansion. The EIS only cursorily considers recreational impacts to boaters and some diving/swimming activities. In fact, the proposed expansion would allow ships to come within 100 meters of swimming areas on Peanut Island. Additionally, this area is home to some of the most treasured surf breaks in Florida. The Port of Palm Beach is bordered by Pumphouse and Reef Road, two iconic surf breaks that attract professional and amateur surfers from around the world. 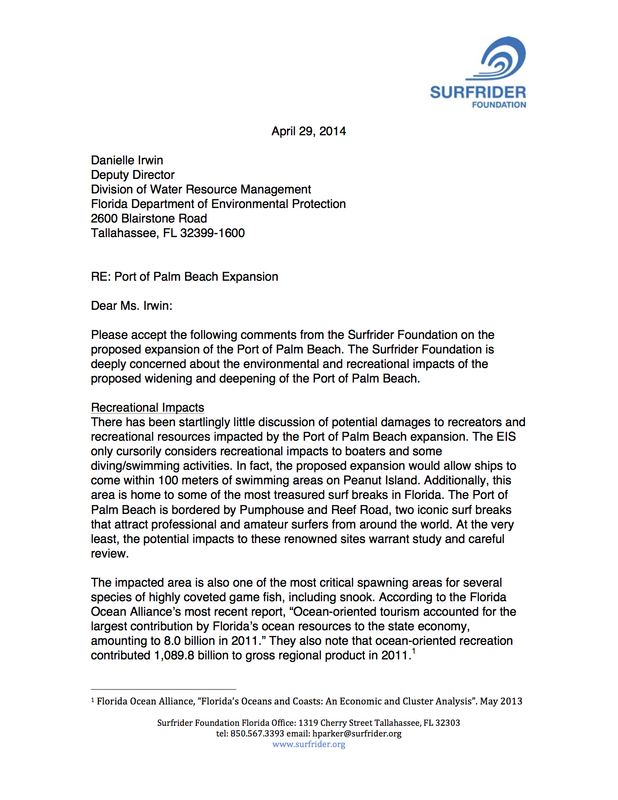 Click here to read our most recent comment letter to the Florida Department of Environmental Protection. Visit the Palm Beach County Chapter to learn how you can get involved! Congresswoman Lois Frankel on Port of Palm Beach Federal Funding from R. Michael Brown on Vimeo.